BusyBox applets are usually not the full versions of their counterparts (read: stripped versions) but I thought it might be useful to some. ... All of that in a 622 KB single binary! Cool. BusyBox v1.19.1_18_0-306-geb28f73.git (2011-01-16 17:56:02 ICT) multi-call binary. There you go, [you can] now try "cat busybox.sh"
Last edited by Midas on Fri Apr 20, 2018 3:48 am, edited 2 times in total. See the TODO_unicode file, which appears to be unchanged in new versions as well. Last edited by Ruby on Tue Oct 03, 2017 3:55 am, edited 1 time in total. 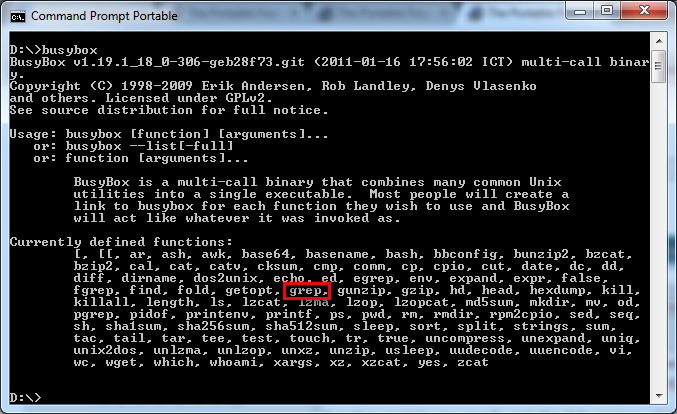 Also, for an UnxUtils alternative, some may want to check UnixKit-tiny at http://eric.chromick.com/cli/unixkit-tiny/ (previously mentioned at http://www.portablefreeware.com/forums/ ... .php?t=338). Last edited by Midas on Fri Apr 20, 2018 3:51 am, edited 1 time in total. Uh... it was accurate at the time I posted it. BTW, busibox-w32 v1.24.0-FRP-15-g0ccf7a0, dated 2015-06-05, has been released (no changelog, see http://frippery.org/busybox/). @%COMSPEC% /C "SET HOME=%~dp0home&& SET PATH=%PATH%%~dp0;&& TITLE BusyBox v1.24.0&& %~dp0busybox.exe sh -l"
Last edited by Midas on Fri Apr 20, 2018 3:50 am, edited 1 time in total. Busybox-w32 v4.4.1 releasead (dated 2016-05-24; changelog not found; download from http://frippery.org/files/busybox/busyb ... 3c3b08.exe). Last edited by Midas on Fri Apr 20, 2018 3:49 am, edited 1 time in total. Remarkable multi-call binary combining many (128 in this release) common Unix utilities into a single 410K executable. BusyBox-w32 is a port of BusyBox to the Microsoft Windows WIN32 API. It brings a subset of the functionality of BusyBox to Windows in a single 410K self-contained native executable. BusyBox v1.26.0-FRP-671-ge135a80 (2016-10-20 15:52:42 BST) multi-call binary. BusyBox v1.27.0-FRP-874-g373ca86 (2017-01-08 09:29:54 GMT) multi-call binary. BusyBox is copyrighted by many authors between 1998-2015.
is configured to run built-in utilities without $PATH search. You don't need to install a link to busybox for each utility. 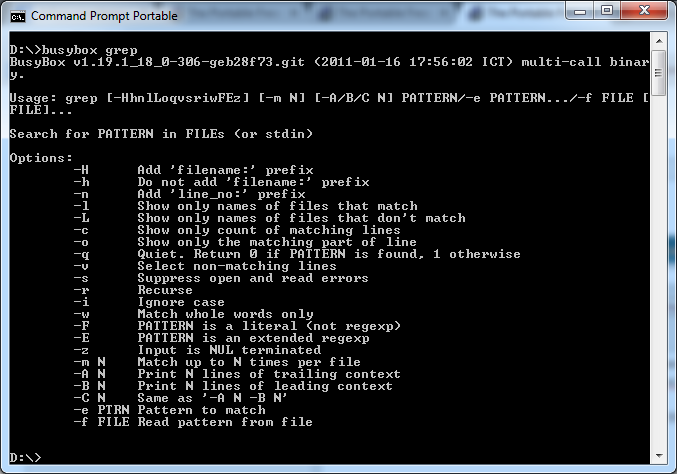 To run external program, use full path (/sbin/ip instead of ip).